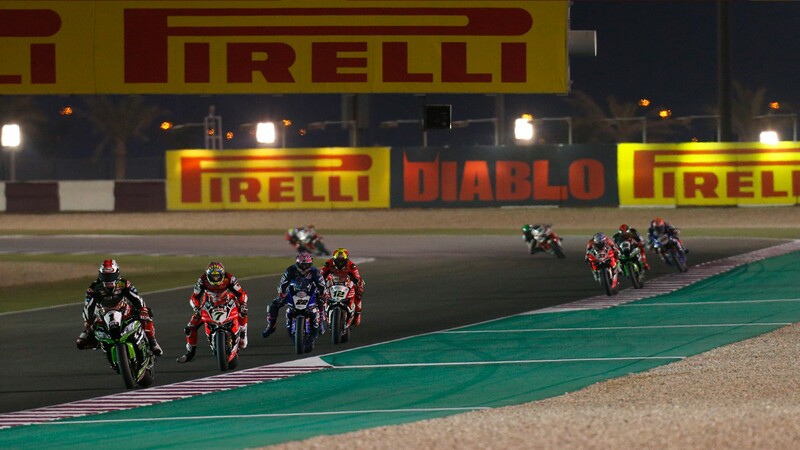 Full throttle and straight into Doha as the MOTUL FIM Superbike World Championship prepares for it’s final round of the 2018 season under the floodlights at Losail International Circuit. We might have already crowned our world champion, but there’s plenty more to play for in Qatar with Jonathan Rea (Kawasaki Racing Team WorldSBK) looking to break even more records, and the small matter of the runner-up to be decided. Preparing to battle in the desert around the 5.3km circuit, the floodlit track will guide our riders towards the end of what has been a sensational season. For 2018 WorldSBK champion Jonathan Rea it’s no ordinary weekend, and he is on a winning streak like no other. Taking his 10th win in a row last time out in Argentina, he is now looking to take the most wins in one season (17), which is a record that has stood since 1991. On top of this, he is hoping to beat his own record of 556 points scored in one season; on 16 wins and 520 points it all seems very possible for the 31 year old. Securing the win – and then the double – for the first time in Qatar last season, it’s hard to look past Rea and his ZX-10RR for the victory. With podium tally of seven out of the last eight, he’ll continue to be one to beat. Gunning for the runner-up spot in the championship chase, Chaz Davies (Aruba.it Racing- Ducati) will be preparing for his final race weekend with the Panigale R twin, ahead of the introduction of the V4 machine next season. A landmark event for Ducati, the British rider will want to pull out all the stops to end 2018 with a bang. Holding a 24 point lead over third position Michael van der Mark (Pata Yamaha Official WorldSBK Team), Davies will be hoping to repeat his performance from 2016 in Doha as he dominated under the floodlights. But one man who will be out to stop Davies is Michael van der Mark, as he is already on for securing his best ever finish in WorldSBK – his best being fourth overall in 2016. Currently sitting 24 points behind Davies, the runner-up spot is possible but it will be a big task for the Dutchman. Yet to stand on the podium at Losail in the WorldSBK class, he took a fourth position finish here last season as he equalled his best result over the line. But with a lights to flag win here in WorldSSP, he has the pace and experience to take him to the top. Determined to end his strong season on a high, he will hope it not just his birthday he is celebrating on Saturday. Eugene Laverty (Milwaukee Aprilia) has a littered past here in Qatar, and will be hoping to end a mixed season on a positive note. A top four in 2017’s Race One is his strongest finish around the 5.3km circuit, and with some podium finishes this year he will be hoping to go one further with his Aprilia. A tough end to the weekend in Argentina saw him score no points in race two, but the pace of the Irishman is never far off the top. With experience in both WorldSBK and MotoGP™ under the floodlights of Losail International Circuit, Laverty won’t be giving up just yet. Red Bull Honda World Superbike Team will be looking to see the back of another difficult season with the CBR1000RR Fireblade SP2 machines, but have made some progress along the way. For Leon Camier, his season has been hindered by injury and despite some strong summer testing, he has been unable to replicate the strong results he showed in Thailand. Argentina brought some more tough race day challenges for the Brit, and as he comes to a track he has a mixed record around, it will be a big weekend for himself and his team. Whilst Jake Gagne will look forward to returning to Qatar, making the most of visiting a track he is familiar with. Scoring points in both races last season – on only his third WorldSBK appearance – he will hope to end the season by showing everyone just what he can do on a motorbike. Loris Baz (GULF Althea BMW Racing Team) will be preparing for his first WorldSBK appearance around Losail International Circuit since 2014. Last time he was here he took a second position in both Superpole and Race One for Kawasaki, but with the BMW it will be a different story. Continuing to work to develop his S 1000 RR, the Frenchman will want to end his tough season on a high, and as he’s only six points off a top ten championship finish, he will be pushing all the way to the final lap. Chilean Maximilan Scheib (MV Agusta Reparto Corse) will be ready for his second ever WorldSBK appearance, and his debut appearance in Qatar. With a solid opening performance in Argentina, with a 13th position finish in race one, the youngster will be hoping to put on another impressive performance as the series comes to a close. Keep up with ll the WorlSBK action from the closing round of the historial 2018 season. ON track action begins at 16.20LT (GMT +3) on Thursday 25th October ahead of lights out for Race One at 19.00 on Friday, and the season finale at 19.00 on Saturday. Follow all the action with the WorldSBK VideoPass.